An impromptu bike ride into Red Hook, Brooklyn with Jesse turned up one of the rarest lowercase L finds ever. Sure we've seen plenty of double lowercase L's, as with this FAll SPECIAl and the LAST CAll. But never, NEVER, have I witnessed a lowercase L, followed immediately by an uppercase L, and then an uppercase i that, upon consideration, was likely dotted because something just didn't seem right. Did the author realize that the lowercase L was a mistake, so he tried recovering with an uppercase L? And then, a few days later, did some other employee, irked by the juxtaposition of the lowercase L and uppercase i, decide to dot the i? We may never know. 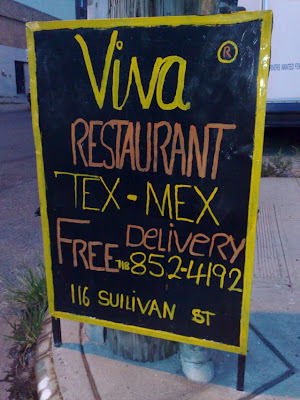 Thank you, Viva, the quaint Tex Mex restaurant on SUlLIVAN Street, for setting this wonderful example. I thought Red Hook was isolated enough to be immune to the lowercase L syndrome, but apparently the affects are more widespread than I ever could have imagined. I'm sitting here at work right now playing Scrabulous (kinda like Scrabble only different rules) on Facebook when I noticed a lowercase L!!! If you notice on the right the Last Move is showing as 'CABlE' and when you look at the game board, the red L is where the correct word is. Delft, Holland is known for its blue and white tile work. Because these knick knacks are sorta pricey, I opted to bring back a Christmas ornament instead. It turns out I think I might have overpaid for a Deift ornament from some place called Hoiiand. They caught on to their mistake by the time they got to word Handgeschilderd though. 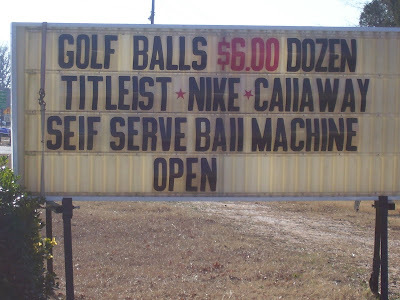 This sign for a SElF SERVE BAll MACHINE, found by Ronnie P. at a driving range in Travelers Rest, SC, isn't very self-serving when it comes to visual clarity with lowercase L's. The CAllAWAY Golf Company probably aren't very pleased with being squeezed in with lowercase L's either. This is probably a case of uppercase L shortage combined with limited space, but I personally would have tried using an upside down 7 than an uppercase i at least for SElF. 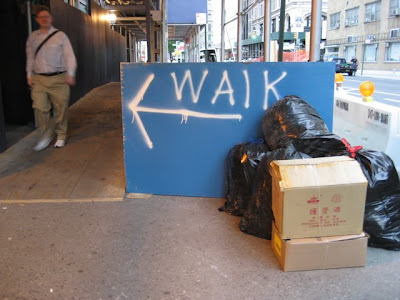 I spotted this WAlK sign, appropriately, at Walker Street and Canal in Manhattan. On the other side of this temporary walkway was an identically L deficient notice, apparently authored by the same person. If you see this sign, run, don't WAlK, to the nearest exit. 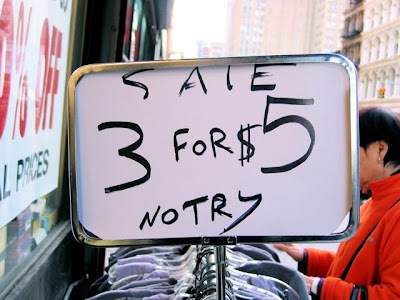 There is a wisp of an upper case L in this SAlE at a store on Broadway and Canal in Manhattan, but it still qualifies in my book. Rich M found this on lowercase L blogroll friend site, PassiveAgressiveNotes.com a while back, just getting to posting it now. 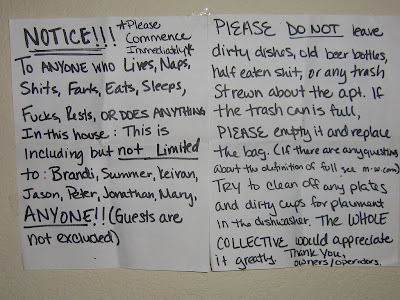 Judging from the tone of this letter, I guess you can't PlEASE everyone. 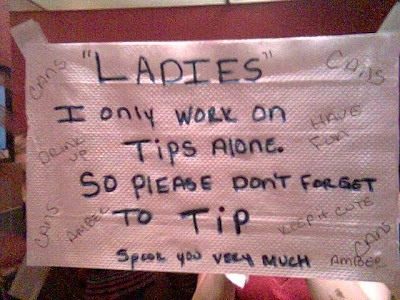 And, also found on PassiveAggressiveNotes.com by Thor: PlEASE don't forget to tip. AlONE is funny looking, too. I've been out of the country and busy with work projects, but finally have time to get back to the things that matter. Let's get back into the swing of things with this excellent find from Staffan V of Stockholm, Sweden, who explains for us non-Swedish speakers that the company Locum printed these Christmas cards, replacing the O with a heart and using all lowercase letters, resulting in one L of a sticky situation.